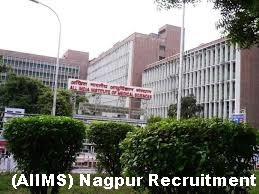 AIIMS Nagpur Recruitment – AIIMS Nagpur Recruitment of 16 vacant posts of Nursing Officer (Staff Nurses Grade-II).All India Institute of Medical Sciences (AIIMS) Nagpur. Applications are invited for the recruitment of 16 vacant posts of Nursing Officer (Staff Nurses Grade-II) in All India Institute of Medical Sciences (AIIMS) Nagpur. Interested candidates can apply before the final date by reading the given instructions. The last date for application is 12 October 2018. Candidates for these positions will be selected on the basis of interview and experience. Application Fee – Rs. 1,000 / – (General / OBC category) & Female / PWD / SC / ST category candidates are exempted from the application fee. For detailed notification and other information, please see the Departmental Advertising and Application Form / Official Notification Link and Application form here. All India Institute of Medical Sciences (AIIMS) has invited applications for recruitment of 53 vacant posts of professor, additional professor, co-professor, assistant professor in Nagpur. The last date for application is October 26, 2018. Candidates for these positions will be selected on the basis of interview and experience. Educational Qualifications – Visit the Jawaharlal Postgraduate Medical Education and Research Institute website for the academic qualification and other information. Candidate for detailed official notification and other information. Employment News paper 06 – 12 October 2018 Page No. 32 See.